Damon here, from LetsTiki.com. 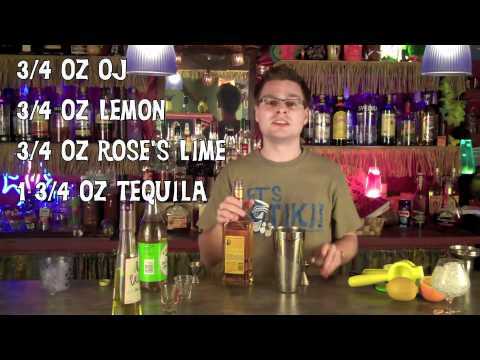 Today we are going to make one of the few Tiki cocktails that has Tequila in it. The drink is called The Yellow Boxer. The origins of The Yellow Boxer are a bit elusive, but the drink itself is similar to a margarita. This Tiki cocktail is perfect for a hot summer day. To make a Yellow Boxer put about a cup of crushed ice into your cocktail shaker. It is important that you use crushed ice with the Yellow Boxer. The recipe relies on the small chunks of ice to melt faster than normal cubes. This causes the drink to be diluted a little bit. The dilution is a good thing; it evens out the strong flavors and makes the drink taste better. Shake it up really good. I usually shake until I get a good amount of frost on the outside of the shaker. Then, strain the cocktail into a brandy snifter that is filled with crushed ice. You can garnish the cocktail with a lemon wedge or an orange wheel and… enjoy! When you take your first sip of this delicious cocktail you first taste the citrus, the orange, the lemon and the lime. It’s not too sweet and not too sour. The orange juice helps balance out the lemon, and Rose’s lime, being sweeter than fresh lime juice, give a nice balance. The citrus goes great with the nice earthy tequila flavor which gives way to the Galliano. You can taste the herbs and just a hint of vanilla. I hope you enjoy the Yellow Boxer. For more Tiki recipes visit LetsTiki.com.